Really now CD sound quality is great. If compare them with the CD from 1980s ... 90s is a huge difference. I think that due modern algorithms and recording analog instruments and voices at high sampling rates. Sound quality digital-analog converter (DAC) depend on quality of the output low-pass filter. For high sampling frequencies more simple design of the output low-pass audio filters. Most filters are difficult to make and tune for low sampling frequencies 44, 48 kHz and below (for audio applications). For such frequencies, even digital filter is serious problem. Analog filter is more problem. - Attenuation in stop band better 120 dB (it's interval 20 000 ... 22 050 Hz for sampling rate 44100 Hz). Furthermore such steep (transition between the passband and stopband) filters has high level of so-called "ringing". It's parasitic oscillations generated by useful signal at the output of the filter. Improving of one characteristic - immediately worsen others. DAC itself make oversampling in the real time (on the fly) to using high frequency sampling rates for simpler (than for low rates) filters. Pre-conversion via audio converter software to high sampling rates allows use high qualitative software filters. It optimized for combination of all features for playback audio. DAC just plays prepared signal that allows use simpler (than for low sampling rates) audio filters to get fine results. No guarantee that oversampling files to high sampling rates will give positive effect. It depending on design and algorithms of DAC. For example, some DAC always produce oversampling . Some (NOS - no oversampling - DAC) - ever. Quality of filters are also different. It may also happen that the file on sample rate 44 kHz sounds better 192 kHz. Without measurement tools, you can try evaluate the improvement in hearing. on sampling rate(s) optimal for your DAC. Owners of AuI ConverteR 48x44 use this. They pick this sampling frequency(-ies) in hearing. Files are given to a single optimal sampling rate. Sometimes make conversion without sample rate changing to eliminate noise of playback for some high resolution audio files (96 and 192 kHz). Sometimes AuI ConverteR used for downsampling to reduce hard disk space occupied by audio files. Now in sampling rates range of AuI ConverteR 48x44 appeared 352800 and 384000 Hz. Free demo version with full audio performance available for download during version 3.7. 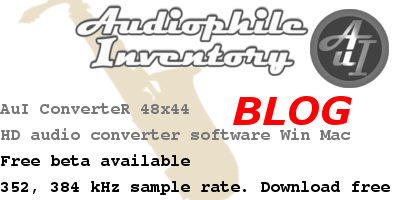 In commercial versions sampling rates 352 and 384 kHz supported for AuI ConverteR 48x44 PROduce-R.